The RSPH, Royal Society for Public Health advises to have a scroll-free September meaning, no social media what so ever. It is true, that some people suffer from social media over dose, others feel trapped by it, and it is easier to bully than in a real life. But, for those people, the scroll-free September is not a solution, is a problem lapse. Anyway, the scroll-free September is not necessarily a total ban. One can choose from a number of roles: as a Social Butterfly you’ll give up social media while sosializing; as a Night Owl you’ll go to sleep at six pm; as a Busy Bee you’ll stop to use the individual some accounts at school or at work; and as a Sleeping Dog you won’t use a mobile or laptop in bed. I would not call the social media a nuisance, or a problem either. Whether I need a break, I do not know. Social media is a part of the working role for many of us, keeping together social life and bringing old friends together. Is this a problem? So, what happened, did you spend or ignore the scroll-free! This entry was posted in Just wandering on September 27, 2018 by citynomadi. Play with GPS and create funny figures on ground and your message will reach the outer world. But also it can be followed as a route! A Briton called Andy Pardy made it political. He had a parcours of thousands of kilometres around Europe. If you do not live in Mars, and you are courious to know how the letters were compiled, the web publication Think Big has the detailed information about this. The reindeer city plan of Rovaniemi, Lapland in Finland is a playful way of creating an interesting route for the tourists before they go and greet Santa Clause at the Artic Circle. The Reindeer Statue in front of Rovaniemi City Library. Read more about it on Nomadi app. The city plan of Rovaniemi samples the head of a reindeer, and if you watch carefully, many of the newly build skiing resorts in the Finnish Lapland have the ones of reindeer antler. The figures by the GPS are often rough, but when you see them as symbols, it really does not matter. This entry was posted in Just wandering and tagged Finland, GPS, Lapland, maps, message, Nomadi, reindeer, Rovaniemi, StopBrexit, Strange maps, tourism on September 2, 2018 by citynomadi. Back To School, In Finland At Least! Every Autumn we have this steady news topic about how to ‘back to school’. And guess what – it is about the type of a smart phone for a 7 year old. Probably it is our heavy Nokia burden, that makes the Finns honestly believe that the age of 7 years is the age to have the first if not a smart phone, but a mobile, and personal phone anyway. It is of course based for the security, communication, sociality among the peers, but the most important reason might be individuality. Also the Finnish government’s school curriculum takes into advantage the mobility, iPads, tablets and digital learning. Unlike in France, where the mobile has been rejected at school, totally banned recently, in Finland it is often allowed to use your own phone during the classes, well, for learning of course. Remember to cover the screen – no matter minor or major! This entry was posted in Just wandering, Uncategorized and tagged curriculum, device, Education, Finland, mobile, phone, pupils, schools, smart phone, teachers on August 9, 2018 by citynomadi. According to the research, a human territory consists only of about 25 locations at the time. The research is not taking any notice for the distances between them. The number 25 is suprisingly little considering the human being’s curiousity and capability to move around. The study is quite exhaustive: it was made with 40 000 individuals participating to the study. They carried a GPS device which tracked their movements. People tend to visit the same places over and over again. That’s why the locals’ are so popular, people are loyal to places. I started to wonder, what are my top 25 locations. Here you are, they are not in any order, these just occured to me. The most amazing thing is, that when a new locations climbs up to the top 25 list, the older locations automatically drop off. You can easily test this on holiday or during the business trip. While staying in another city, you easily make new routines, the hotel is obviously a base camp, the nearest metro is soon located, the nicest cafe found – for a week. Actually the time span is more and more interesting, do people have a similar way of loyalty, or are some individuals quicker to find new places? My list has dropped off the library, and another, which I used to visit weekly if not daily, a cafe Lasipalatsi where I used to have a latte and croissant when arriving early to Helsinki, Library 10 in Helsinki, where I used to wait for the train back home, the important places for my family members and so on. This entry was posted in Just wandering, Uncategorized and tagged behavior, everyday, GPS, location, Study on July 25, 2018 by citynomadi. Accurate maps are needed during the Finnish summer events! The Helsinki summit confused the traffic for one day. The closed streets for hours, public transport route reductions, private cars strongly advised to leave at home. Media gives out tips of the best places to spot the famous visitors Trump and Putin during their short stay in Helsinki. The tourism marketing in Helsinki had a few days and a fortnight to arrange the marketing of our beautiful capital. Be prepared for the suprise suprise visitors, proximate 2000 influential extra people, most of them journalists, just for a few days’ time. A similar kind of challenges are met in Pori, a small town by the west coast of Finland. During one week of July three big events take place: Pori Jazz festival, political event of SuomiAreena ja the Housing Fair. Those who are the stars of the events and those who work for them have no problems in findind their ways in the new traffic circumstances. But the vistors, and inhabitants in the area. How do they manage? Citynomadi partipates to the AVM-project of a consortium of companies (Autonomous Vehicle and Mobile Services) which is present in Pori at the Citizen Square of SuomiAreena event at the stand 72. We made a simple guide map for the superweek in Pori, just to remind of the few roles of location based data in the everyday life, but also in events. The print map, but also the pdf map is stubborn and old fashioned, or what do you think? 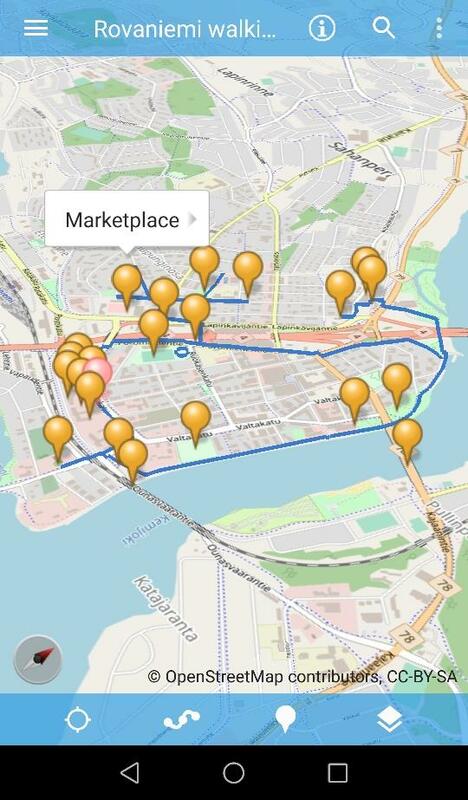 The event map of Pori in July 2018, download the Nomadi app for free, available on app.citynomadi.com! This entry was posted in Just wandering, Uncategorized and tagged app, event, Helsinki, Nomadi, WhatWhereWhen on July 16, 2018 by citynomadi. 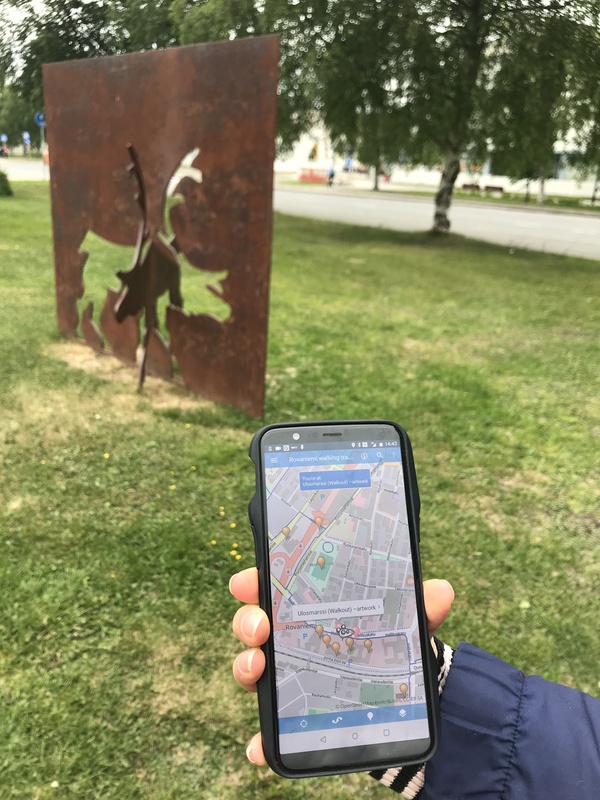 We have had a project in Finnish Lapland called Village Stories, in which we produced an app with several routes in six villages aroud the Eastern Lappish areas. It was launched in January this year and gives you a nice overview of the life in Lapland. Download the app and watch the videos! Also, please rate the app! The villagers will update the content for the app and therefore me and Nadja took a tour for Rovaniemi, Kemijärvi, Pelkosenniemi and Sodankylä to give training for them. We rented a car in Oulu and drove 1000 kilometres in two days. While driving in Lapland you need to be prepared for the reindeers, they tend to conquer the road. No hurry, take you time. Sometimes they are for a serious danger for the traffic. Here comes an app called ‘Porokello‘, Reindeer alarm by the local government of Finnish Lapland. This is a neat example of utilising location based data and crowdsourcing in real time. You have a map with recent observations and you can give out yours, if you happen to spot the reindeers. We did. We tried to notify, but the app approves only the observations of the pros: truck, bus and taxi drivers at this point. Maybe in the future also the ones of amateur drivers, because the app is very useful for all drivers in Lapland. A reindeer on the road from Sodankylä to Rovaniemi. Photo from our car’s side window..
Sauna after a long day on the road, in a summer hut between Kemijärvi and Pelkosenniemi. It is so bright because the sun never goes down around Midsummer in Lapland. This entry was posted in Just wandering, Uncategorized and tagged alarm, app, driving, History, hygge, Kemijärvi, Lapland, lifestyle, maps, Nomadi, Oulu, Pelkosenniemi, reindeer, Rovaniemi, santa claus, Sodankylä, stories, training, village on July 8, 2018 by citynomadi. Maps can be informative, plain or something in between. Geographic data covers more than streets, seas and railways, and you can enrich the map with any information and create a so called theme map. We’ve found a Creative Commons map based on the Open Steet Map information by Stamen Design, and it’s something else. Maps are global, they cover the whole world. It’s fashinating to watch the geography of Finland, of Tampere, our home town, from the totally new perspective. There not as up to dated as we are used with the Open Street Maps. The global map has been colored with a watercolor style, and it surely looks beautiful. It is still easy to understand and one can navigate through it. You can follow the routes and waterways and locate your self on it. We’ve implemented the maps on Nomadi app, and they are an option for any of our route creators. Just contact us! There is always one default map for a route, but usually one is able to switch the map by clicking the icon in the south-east corner of Nomadi app! As an example you can have a look at the Mobile game for Helsinki Design Week in Helsinki and the top attractions in Venice. Notice our spotty on Tampere in the far horizon of the Helsinki map! It here I am writing this blog at the moment. Download Nomadi app on app.citynomadi.com and admire the new outlook of maps, watercolored maps. This entry was posted in Just wandering, Uncategorized on August 7, 2017 by citynomadi.